Ready! Aim! Fire! Catapult King is a fresh take on the physics puzzler. We've gone from one extreme to the other in our reviews today. On the one hand, there's the intensely engaging nervousness of Introversion's outstanding hacking simulator Uplink, and on the other hand we have Catapult King, a far more lighthearted and relaxing title that settles comfortably into the more family-friendly nature of the App Store. This is what you call a good shot. 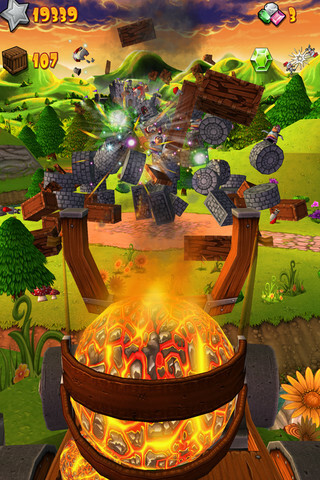 Smashing up some rather suspiciously precarious platforms in order to bring the house crashing down may not sound like the most original proposition on the App Store, but Catapult King has a couple of twists that separate it from the pack. 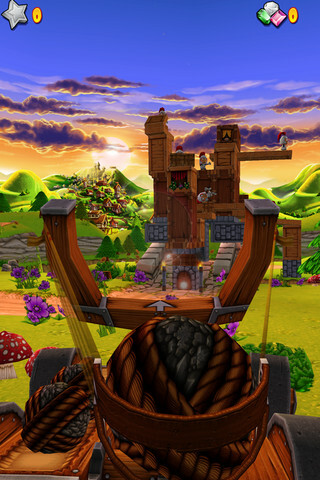 For a start, you take a near first-person perspective on the action, looking straight down the barrel of your catapult. Up head lie a series of rickety wooden platforms with knights balanced both on top and around them. The objective of the game, you'll have guessed by now, is to fire your catapult at the structures and take down all of the knights with as few shots as possible. As well as taking a different viewpoint on the proceedings, it's also a spectacularly gorgeous game, with lush green 3D environments dotted with powder-puff clouds and swooping hills and valleys. Lovely. Catapult King is a seriously pretty game. 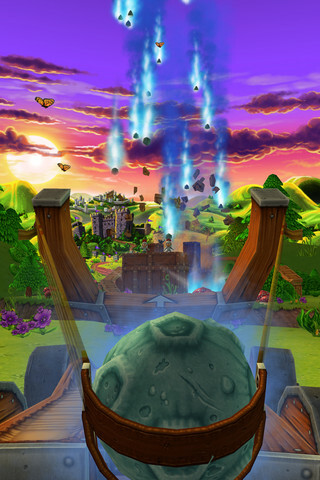 All of the action is controlled very nicely on the touchscreen: swiping your finger slowly back prepares the shot, while letting go sends the projectile flying towards the enemies. If you want to adjust the trajectory, you can either move the entire catapult left or right, or use a cog nestled in its base to shift the height up or down. It can take a little while to get used to the space and distances involved in the game, but fortunately you can choose from a number of upgrades before taking your shot. There's a magical aiming line which will give you a good indication of how to line up your shot, while choosing the explosive ammunition allows you to create a further explosion with a tap of the screen. Yet another upgrade rains multiple shots down from the sky. Each of these upgrades uses up some of the magic you earn for completing levels, so you'll either need to be sparing with their use, or dip into the in-app purchase store to get a refill. You can upgrade your shots if you possess enough magic. We had a lot of fun with Catapult King: the graphics are gorgeous, it's an interesting take on the typical physics puzzlers on the App Store, and it has a very responsive control system that befits a precision puzzler such as this. You may find the game to become a little repetitive before you've exhausted the 64 levels included, but you'll certainly get a dollar's worth of entertainment out of Catapult King long before you reach that point. What's Hot: Very responsive controls, upgrades to suit every gamer ability, and beautiful environments. What's Not: You may tire of the concept before completing all of the levels.